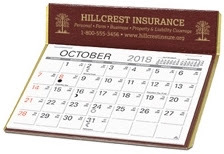 Keep your name and message on your client's desk with this desktop calendar. 13-Month Format. Extra-large memo-style calendar pad allows room for notes. Calendar includes Julian Dates that note the number of days into the year and left to go. Comes with FREE Seasonal Greetings Cards & Envelopes! Size: 6 1/2" w x 5 7/8" h.
Imprint Area: 5 3/4" w x 1 1/4" h.